Sunday, 5 pm, Karori scout hut. 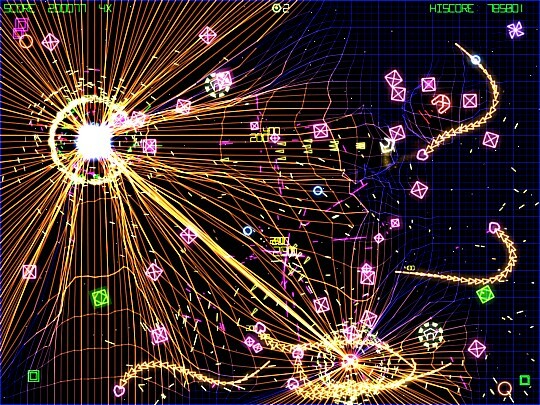 On a gorgeous day like this, what better than to sit on one’s arse and watch brightly coloured moving objects? Its the Wearable Arts parade today, see cool stuff without paying a hundred and fifty-five dollars. From Parliament, leaving at 12.45, to Civic Square. And tieke will be a flower, on stilts. I’m never happy with anything at all ever. Even the carbon fibre unicycle. Which is stupid, coz its fantastic. I seem to be the only person in the world who gets enough sleep. I’ve been far less intoxicated than you think I’ve been. Some of my best times have involved borderline hypothermia. I can still find my way across Wiltshire without going anywhere near a main road. That’s two ten-hour days in a row, but f’it, I’m GETTING STUFF DONE. Right, to pass on this lurgy, I tag russiandolls coz she doesn’t post enough, fuvenusrs, the memewhore, bewarethefish, the loud person, and busycivie, segrada, and llearch coz I don’t think I’ve ever met them. This news went out from the NZ Press Association. How to make aluminum foil – and make me swoon. Oh aluminium, how I loved you so. No idea who I was telling about it, but The Exile. We read it for the articles and thank the Russians for their lax libel laws. But this is a game in disguise. Its really a strategic herding and farming game. Its a very fast RTS. Manga engineering – huge Russian ekranoplans (half plane/half ship). 500 tons, 400 kmh, ten jet engines. Sadly/luckily now sitting rusting on youtube. Just No! Jet-powered Sinclair C5 – I’d say it keeps the population down, but its not the engineers that we want to get rid of. My report is in the Dom Post, page A14, though sadly not on their website. However, the article says: “Scientists warn of energy crisis – New Zealand faces an enery crisis within a decade unless habits change now” and that’s not really what we’re saying. And there’s a few other mis-readings, “national fossil fuel reserves are almost exhausted” – no, reserves of oil and gas are short, but we’ve got literally mountains of coal. And they didn’t quote me. But its a start. The Energy Panel of the Royal Society of New Zealand has released its report “2020: Energy Opportunities”. The Panel comprises a selection of our best energy experts from academia and business, covering a wide range of experience in energy sources and uses. They consider that the future of our energy sector is perhaps the most important problem currently facing our nation, affecting both our economic growth and our response to climate change. The government’s new energy strategy is in development and the Panel members hope that this report will provide solid and objective technical advice that will help to build a consensus on what this strategy should be. 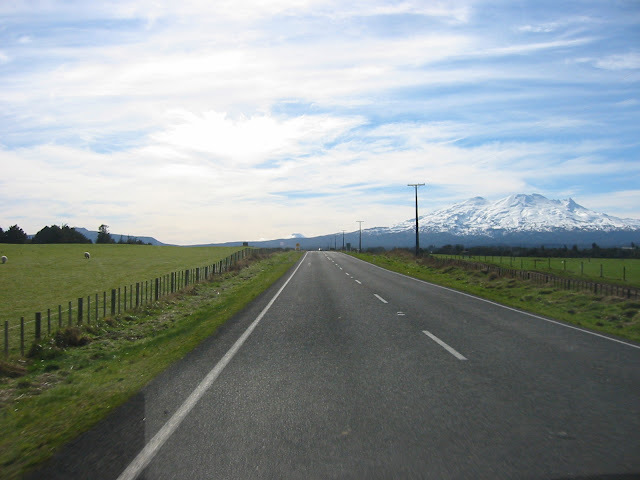 1) New Zealand should move to a low or zero-carbon basis for energy and transportation. 2) Biofuels have the potential to provide both the nation transport fuel and a new rural export industry. 3) Our vehicles will need to be modified to use renewable fuels and a wholesale transformation of transport will be required, including a change of behaviour on the part of the public. 4) Our electricity supply has the ready potential to reach zero carbon emissions and electricity markets could create a better investment balance between supply and demand. Currently an investment in efficiency will make available more electricity than the same investment in generation yet investments in generation continue to outweigh investments in efficiency. 5) Some form of price on greenhouse gas emissions is inevitable and we should prepare ourselves for that price. Organisations and businesses should start quantifying their carbon emissions, begin reducing them and identify the new business opportunities and threats (e.g. food miles) that the drive to reduce carbon emissions will present. 6) A sustained research effort is needed to drive indigenous solutions to our energy problems, such as reducing methane emissions from farm animals, investigating barriers to energy efficiency, growing energy crops for NZ conditions and marine energy technology. Our energy system will continue to evolve in response to changes in technology, economics and the international response to climate change. We are moving to a carbon-constrained world, where a price will be paid for every emission of greenhouse gases. In that world, New Zealand will be able to use its natural renewable resources to maintain a competitive advantage through low cost renewable energy sources, smarter and more efficient use of the energy we have and by putting some substance behind our clean, green claims to protect our industries from dubious claims such as the “food-miles” debate in Europe. Yesturday’s economics lecture included pirates! But not in the fun way. Oops, American Apparel no-sweatshop clothing made in sweatshops. Reading a report on a workshop on ultraviolet light and health, I just came across the International UV Intensity scale. It was developed by the Canadians and runs from one to ten. New Zealand can hit fourteen. Go us! Also, trees provide significant UV protection, duh, and when you read a scientific paper that says: “Finally, we compared the UV dose while skiing with that received playing golf in the summer at nearby locations” that you realise that metallurgy was the wrong science to do. Exploded meat vapour – its the new high protein, inhalable snack for today’s busy people on the go! Climbing tonight, Fergs, 6 pm. In Which Jez Leaves Wellington! Drove more in three days that I normally would in three months. 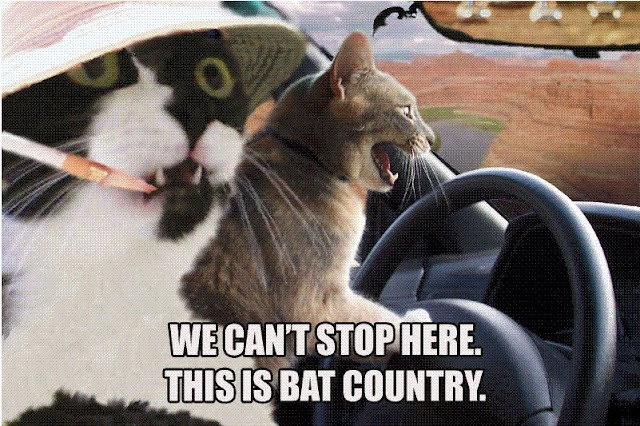 Driving is really boring, despite the sub of subness. Sitting still for that long is tedious. In fact, getting to anything past Tawa is tedious. There was much sitting in hot spas. The DeBretts resort at Taupo is old but good, though their slide is not designed for people who are six foot tall. 42 Celcius in the hottest pool, oh yes. 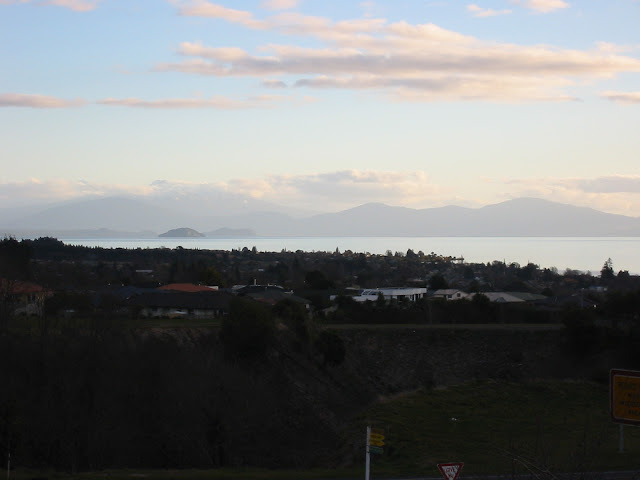 The wave of decent cafes sweeping across the land has crashed into Taupo. Me at Ruapehu normally means me hunting out the steepest of steep, or the narrow twisty gullies. (In fact, Gun Barrel at Treble Cone is both, and thus heavenly.) This time, it was just warp speed. Smooth, hard, slightly icy, hoonage. Whakapapa was bumpy, even out West, and the West return is murder on calves. Turoa was well groomed, hence ludicrous speed. The place we stayed had a TV. So I watched drag racing and the BBC news. They didn’t have the ultra-fast camera, which I find fascinating. And they had nice benches. 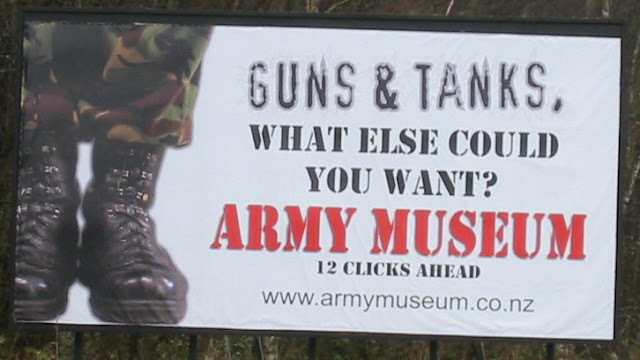 The Army museum has new signs. We took a pic for Rhi. Its very “does what is says on the tin”. You may notice that I rarely write about people, or my interactions with them. I know some fantastic people, and more interesting ones. I also prefer talking to them above writing about them. And then on saturday I was very tired, so I made plans for Biscuit. Bad plans. Books for this jaunt included Naomi Novik’s “Temeraire” – muskets, dragons and the Royal Navy, together at last – and Ken Macleod’s “Learning the World”, which includes a fantastically specious arguement for why the human race is about to go extinct. And I’m still not sure how to pronounce “Temeraire“. From the first time I saw him, I knew he was going to the special hell. “the annual average usage of aggregates per person is now over 10 tonnes” – what do you plan to do with your ten tonnes of crushed rocks? Now that we have real broadband at our place, Youtube videos download in realtime. Hence someone is on a mission to watch videos of cute kittens. All of the videos on the intarweb. And then ponies. Home is now on the web, via the joys of TelstraClear. Now, I just have to get the wireless modem/router acting as just a wireless router in subserviance to the cable modem, and I’ll be happier than if I was drenched in chocolate.